Now that Microsoft Windows Small Business Server 2003 is fading into history (slowly, I’ll admit) and I have revamped my Networking with Small Business Server course to focus on SBS 2008 I have decided to post the slides from my three part SBS 2003 course for anyone to download. [This is the second of a three part series that covers the basics of installing, configuring and maintaining Microsoft Small Business Server 2003. [This is the third of a three part series that covers the basics of installing, configuring and maintaining Microsoft Small Business Server 2003. Now that the focus has moved to SBS 2008 I’m not going to be going back and making any changes to the SBS 2003 course, so rather than sit and gather dust in some forgotten corner of my hard drive I hope that someone out there obtains some benefit from what I’ve posted like all the students who have attended my course over the years. I’m always interested in things that can improve personal productivity and well being. That’s why I was fascinated by a TV documentary (in 2 Episodes) called Dead Tired. You can view the first episode online by simply clicking here. It examines the effects of sleep deprivation and how that contributes to a whole range of aliments including obesity, high blood pressure and so on. It also demonstrates that you are twice as likely to make mistakes when you miss out on even a small amount of sleep. One of the most interesting experiments they ran was with putting someone with sleep deprivation behind a wheel of a car for 2 two hours while monitoring them. They found that for 25 minutes in that 2 hours the driver was actually asleep! In some cases their brain was asleep even if their eyes were open. Scary stuff. The show demonstrates how chronic lack of sleep has a direct impact on the physiology of the body including reduced heart function and increased chance of diabetes. Another interesting statistic is that 20% of the worlds workforce is composed of shift workers and these people generally fail to get enough sleep. This has direct impact on their lives AND the work they perform, which potentially affects a lot more people. In many cases these days we generally overlook the effects of sleep deprivation and consider it weak to need ‘sleep’. However, studies show that individuals who have better sleep patterns are much more productive and far less error prone. So stop and think about it. If you don’t feel 100% maybe you aren’t getting enough sleep? If you want to see if more does make a difference try getting at least 7-8 hours of good sleep for a week. I guarantee you’ll notice the difference. Pretty cool eh? Who would have ever thought? Not me certainly. Hmmm, maybe I should get around to uploading one of my other creations. I’ve got plenty about SharePoint but I’m really keen to do something about OneNote. If you have any ideas or suggestions please let me know (director@ciaops.com). The next trick is to see whether it actually sells more now that it is on Amazon. This I think will be a much harder task but hey it’s a start! My Introduction to Small Business Server course starts this week at Macquarie Community College at Carlingford. It will run for three consecutive Thursdays from 7-9pm. It will provide an overview of the benefits of a Small Business Server network, the differences between SBS 2003 and SBS 2008, then a complete installation of product. From there the course will examine in more detail the requirements for configuring and maintaining the product as well as focus on how to ensure that your whole network is kept secure. The course is designed for those who are considering a server or those who already have Small Business Server in their business. The course includes notes and is help in a friendly lecture style format which encourages discussion and questions. For anyone who’s applied SP2 to a SharePoint Server site (not Windows SharePoint Services tho’) you should check “Attention: Important Information on Service Pack 2” from Microsoft. Basically if you have an affected installation your license has been reset to a 180 day trial. There are some work around for some versions of SharePoint but there is also a patch on the way. 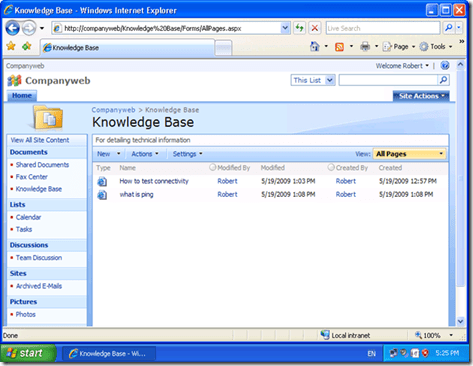 Windows SharePoint v3 is unaffected but Search Server Express 2008 is affected. Don’t understand why as Search Server Express is also a free download from Microsoft, but given this is the work from Microsoft you need to ensure that you install any forthcoming patch so the product won’t expire. Hopefully not a major issue but certainly something that would worry some very large SharePoint installations. Luckily as SBS 2008 is powered by Windows SharePoint there is no issue. When you create wiki in Windows SharePoint the first thing you normally do is delete the two default items that SharePoint creates for you. You then start populating the wiki with your own items as show below. This means that when you click on the link for your wiki you will be taken to a list of items like that show above. However, what happens if you want to come to a landing page and from there select different options to perhaps make it less confusing for users? All you need to do is create a new item in your wiki called ‘Home’, like shown above. 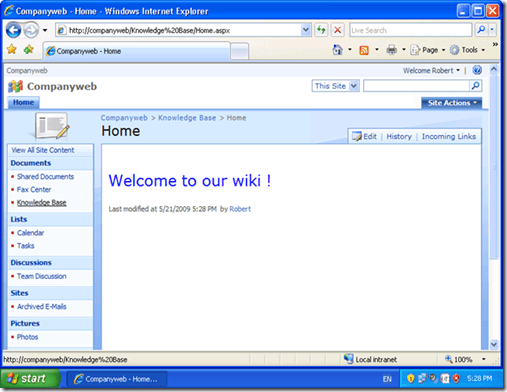 Now whenever anyone click on the link for the wiki library they will see the ‘Home’ page displayed. 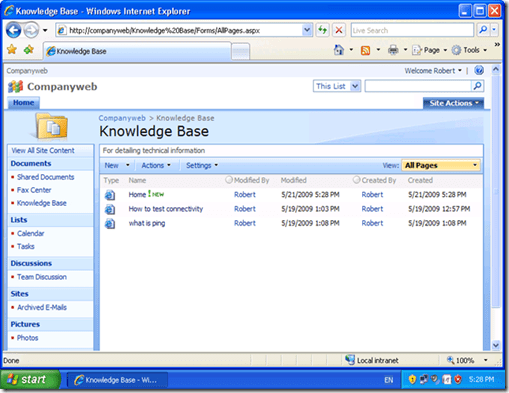 If you click on the name of the wiki in the breadcrumb navigation at the top of the page (in this case Knowledge Base) you will again see all the items in your wiki. So to create a default landing page for your wiki simply create an item called ‘Home’. I found that if you are already using ActiveSync to Exchange server then you can’t sync your emails, calendar and contacts to My Phone but you can do other stuff like text messages, photos, documents, etc (just watch the data transfer charges). My Phone also currently give you 200MB free space into which you can store your information. I think My Phone is really handy, especially for those who don’t sync to Exchange server but it would be nice if you could sync to Windows Live or SkyDrive wouldn’t it? But hey, it’s only beta software so maybe in future versions? Just read “In Defense of Distraction” from the New York Magazine, which although 8 pages in length,is a very good article on how distractions are a real problem and how human beings are programmed to respond to distractions. Clearly, we will always have to cope with distractions but learning how to control them is the biggest secret we need to learn as we encounter more and more every day. “Q. Are we living through a crisis of attention? It is interesting how distraction is compared with smoking, in that, we as yet don’t full comprehend the impact it maybe having not only in our jobs but also in other areas of our lives. The worry is that everyday we face more and more distractions that are being targeted more effectively to the way our brain’s process information. So not only are we facing a greater number of distraction but we are also facing distractions that are more effectively targeted to distract us. What chance do we have? Our brain’s are programmed to enjoy all the benefits of distraction but, left to it’s own devices (like overeating) there can be serious consequences that may not at first be all that obvious. Read the article and have a think about whether you are letting distractions, especially from technology, control your life. If you are honest you may find they are more in control that you thought.